TrendSpaces. Office Furniture that presents a forward thinking image and encourages team collaboration that your business must have in today's fast-paced business world. Far apart from the ordinary in both flexibility and style. 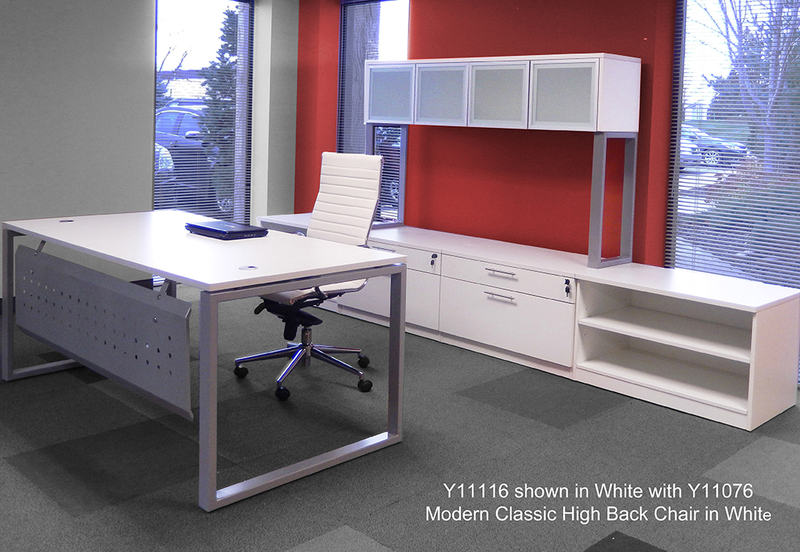 Offers desks and storage solutions for the executive office as well as the open plan collaborative workspace. A rich combination of strong, welded steel frames, durable laminate work surfaces and storage units and tempered glass enclosed overhead hutches. These attractive features are key to the cutting edge design element of this premium office furniture series. 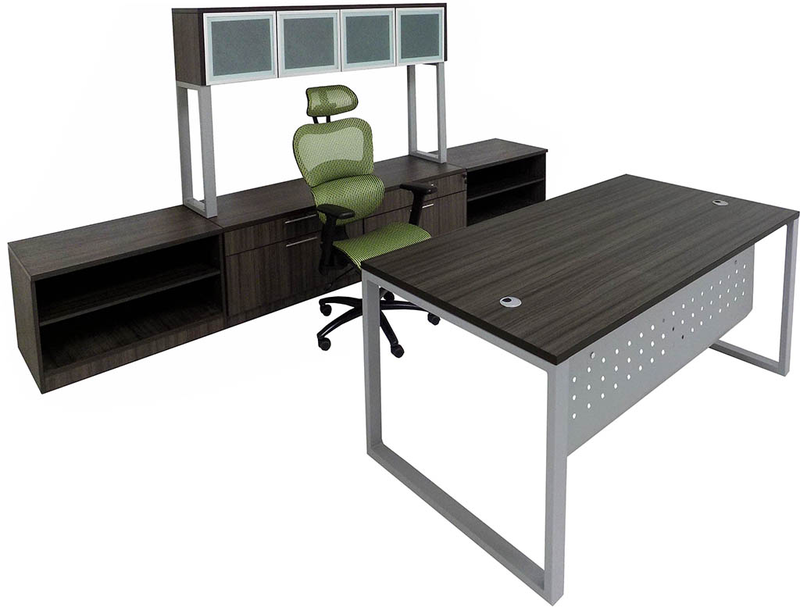 TrendSpaces Executive Desk Set includes Y11121 Executive Desk with Y11129 Steel Modesty Panel (71"W x 35-1/2"D), two Y11130 36"W Open Storage Units, two Y11131 36"W Box/Lateral Storage Units and Y11134 Glass Door Hutch w/Legs. 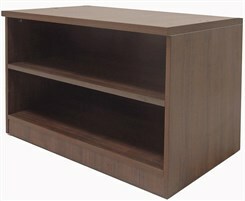 Wall unit measures 142" wide overall but is comprised of modular units to arrange as you like. Ships unassembled. Shipping weight 639 lbs. PRICE INCLUDES SHIPPING! (Truck shipment - see Terms & Conditions). IN STOCK! 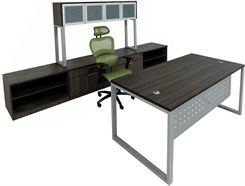 TrendSpaces Executive Desk Set sold above. See matching items below. Create your own individual work environment from our selection of modular components, or, opt for our preconfigured packages for additional savings. 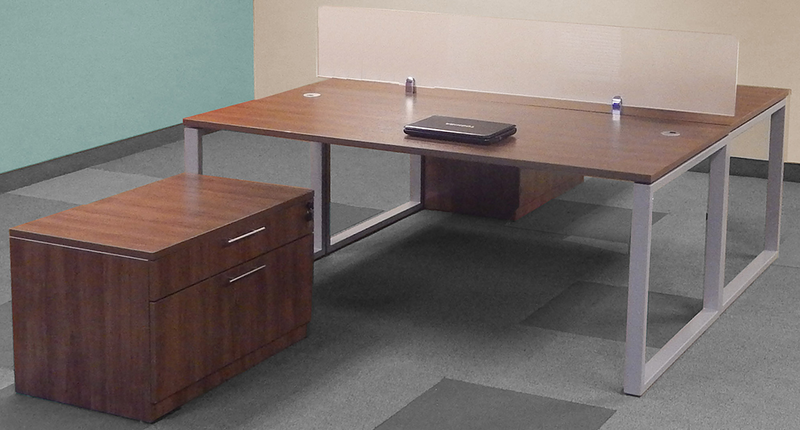 Either way, you will find TrendSpaces to be the most current design and best value in office furniture today. * Strong welded steel loop leg frames measuring a full 2-1/2" x 1-1/8". 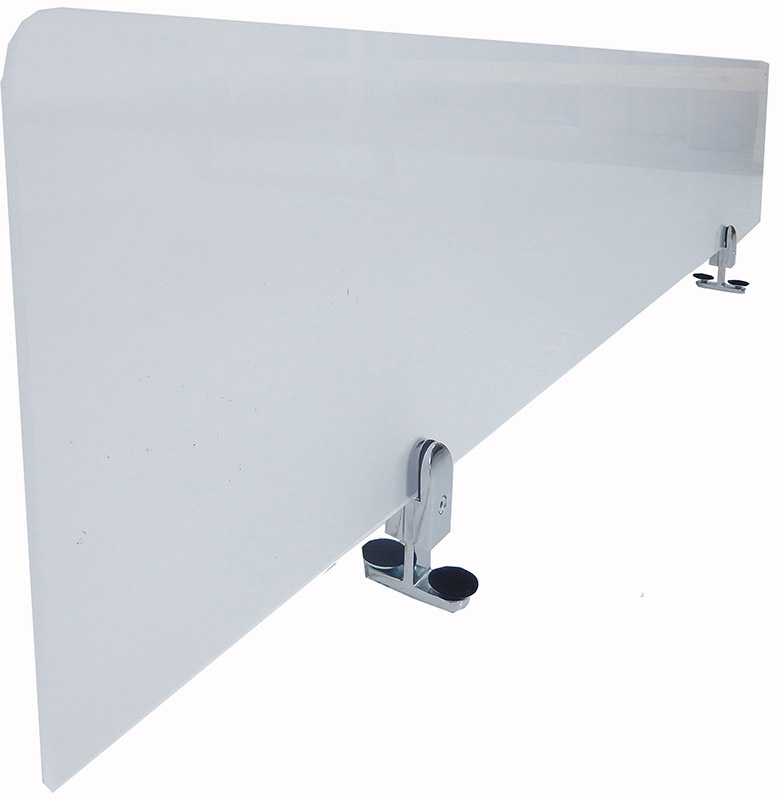 Leg frames are bolted to a full length 2" x 2-1/2" steel support channel that doubles as a cable raceway. * Silver powder coat paint finish on frames and accessories. * Durable 1" thick laminate work surfaces in attractive and trendy color schemes with 3mm edge banding to resist scratches and scrapes. 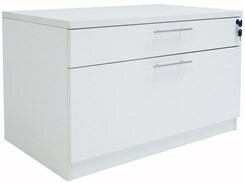 * All drawer units are locking and feature top quality full extension ball bearing drawer slides. * Attractive nickel hardware drawer pulls. 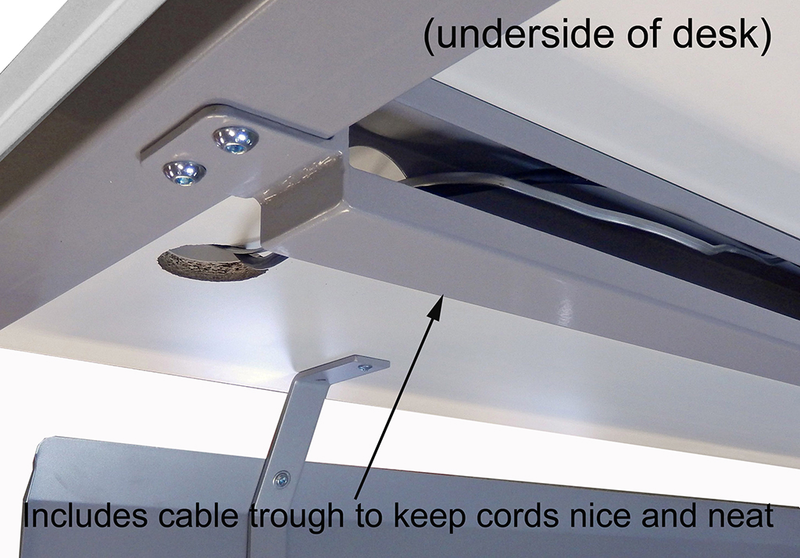 * Convenient desk top cable grommets and integrated cable trough in desk frame keeps all cables neat and organized. 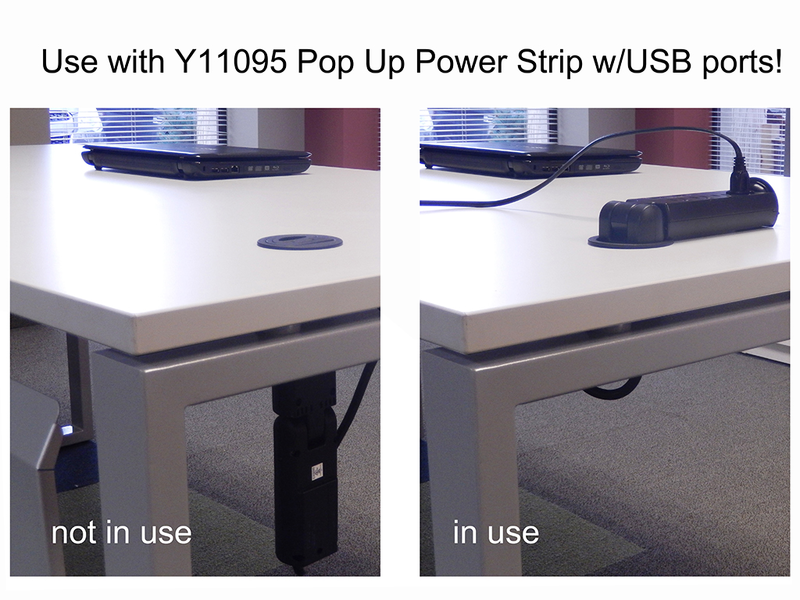 * Optional pop-up power strip with USB charging ports fit neatly in existing desk top grommets. * Optional frosted acrylic privacy screens for use in open office situations. * Easy to reconfigure as your needs grow or change. 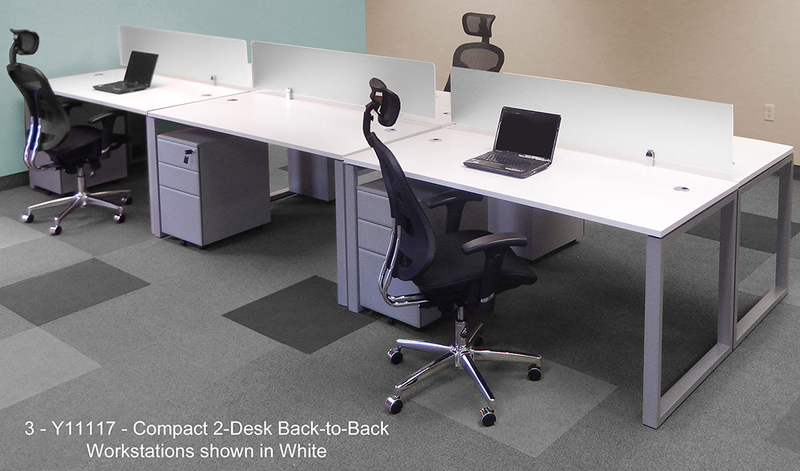 * Choice of preconfigured packages at a savings or individual components to create your own ideal workspace. 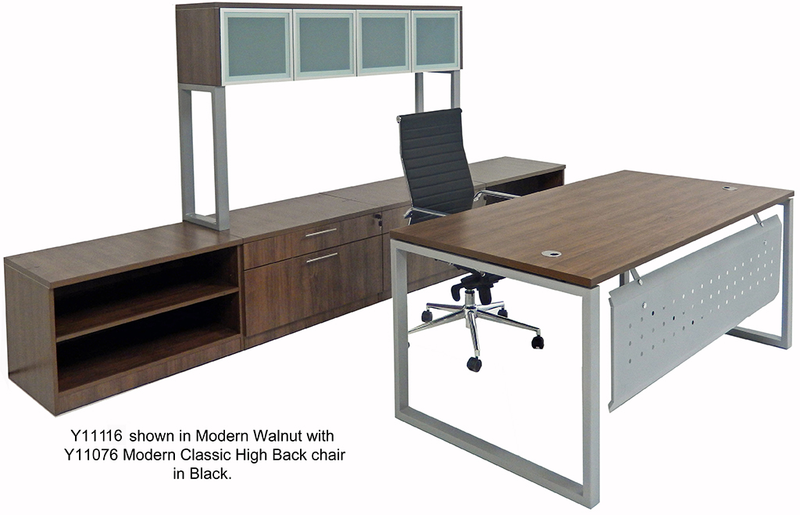 Ideal for open office benching and collaborative tasks. 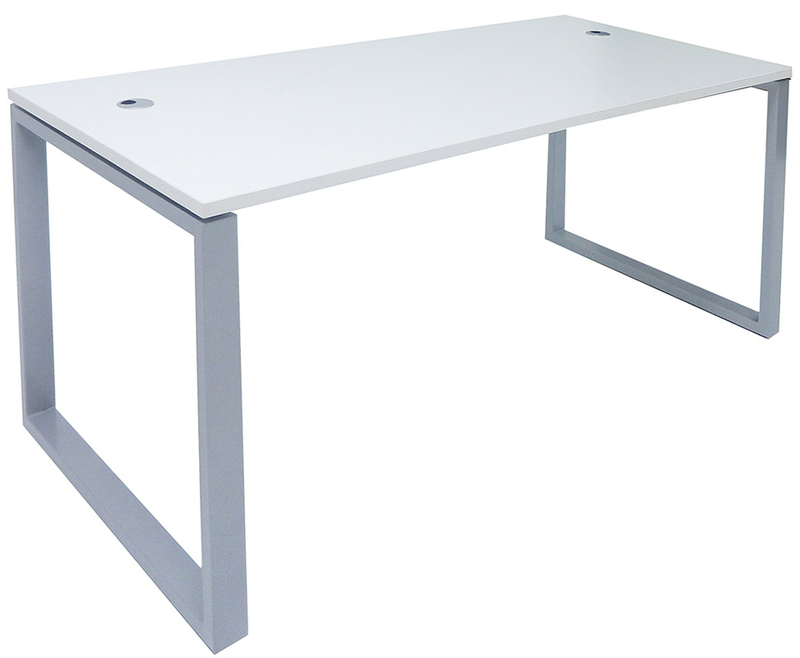 Add on Compact 2-Desk Back-To-Back Workstation Sets as needed. Each set includes two Y11122 Manager's Desks, two Y11128 Steel Box/Box/File Mobile Drawers and one Y11136 63"W Acrylic Divider with 2 Two-Sided Brackets. Requires 66" x 61" of floor space. Ships unassembled. Shipping weight 304 lbs. PRICE INCLUDES SHIPPING! (Truck shipment - see Terms & Conditions). IN STOCK! 1 - 2 $1,799.00 ea. 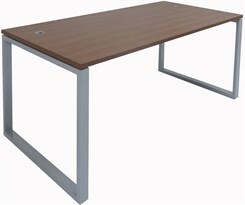 Ideal for open office benching and collaborative tasks requiring a little extra work area and file space. 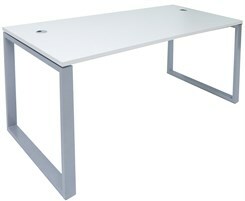 Add on Large 2-Desk Back-to-Back Workstation Sets as needed. 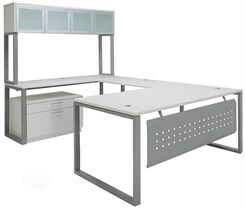 Each set includes two Y11121 Executive Desks, two Y11131 36"W Box/Lateral File Storage Units and one Y11138 71"W Acrylic Divider with 2 Two-Sided Brackets. Requires 71" x 144" of floor space. Ships unassembled. Shipping weight 452 lbs. PRICE INCLUDES SHIPPING! (Truck shipment - see Terms & Conditions). IN STOCK! 1 - 2 $3,699.00 ea. 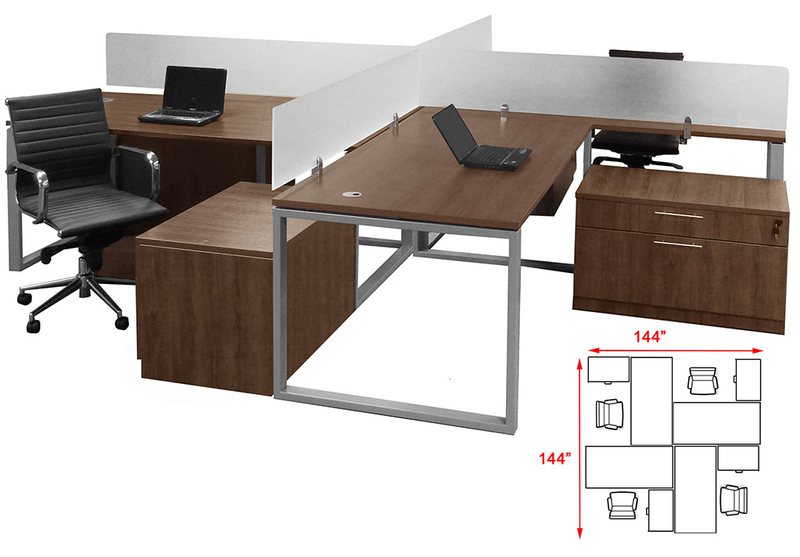 Complete 4-person workstation for the collaborative open office plan. 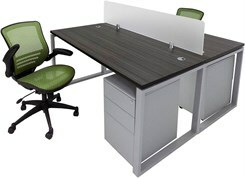 Includes four Y11121 Executive Desks, four Y11131 36"W Box/Lateral File Storage Units, and four Y11137 71"W Acrylic Dividers w/Two Mounting Brackets each. Requires 144" x 144" of floor space. Ships unassembled. Shipping weight 928 lbs. PRICE INCLUDES SHIPPING! (Truck shipment - see Terms & Conditions). IN STOCK! 1 - 2 $5,699.00 ea. 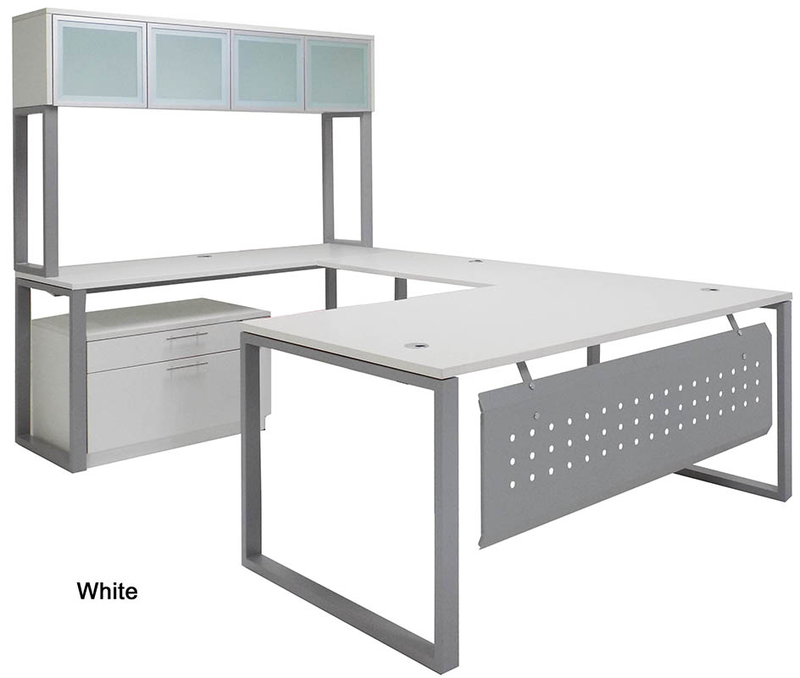 Complete workstation package for four users. 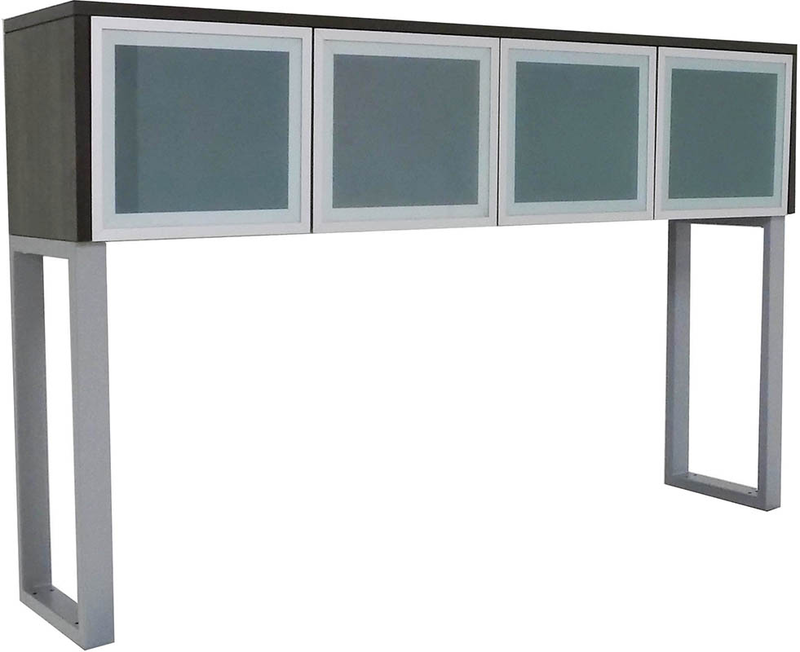 Includes four Y11127 Executive Storage L-Desks w/Glass Door Hutches and four Y11138 71"W Acrylic Dividers w/2 Brackets each. Requires 12' x 12' of floor space. 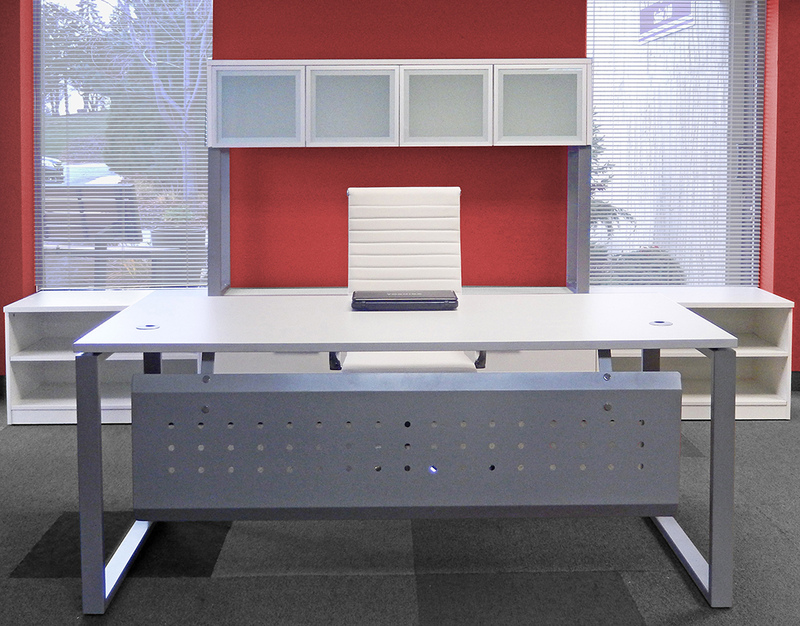 Workstations are completely reversible and can be moved or rearranged at any time to fit your needs. Use as a cluster or lined up along a wall. Ships unassembled. Shipping weight 1772 lbs. PRICE INCLUDES SHIPPING! (Truck shipment - see Terms & Conditions). IN STOCK! Provides ample work area and open leg space under desk. Measures 71"W x 35-1/2"D x 29-1/4"H overall. Ships unassembled. Shipping weight 110 lbs. PRICE INCLUDES SHIPPING! (Truck shipment - see Terms & Conditions). IN STOCK! 1 - 2 $369.00 ea. Measures 66"W x 30"D x 29-1/4"H overall. Ships unassembled. Shipping weight 91 lbs. PRICE INCLUDES SHIPPING! (Truck shipment - see Terms & Conditions). IN STOCK! Reversible for right or left hand use. 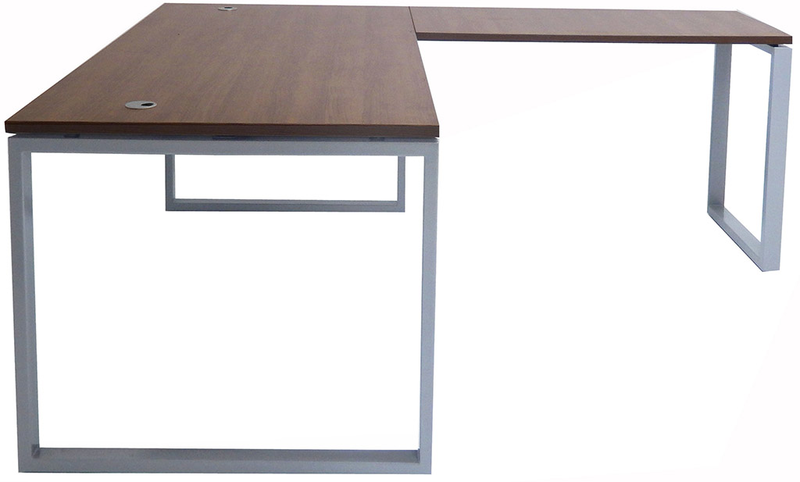 Main desk measures 71"W x 35-1/2"D x 29-1/4"H. Return desk measures 47-1/4"W x 23-1/2"D x 29-1/4"H. Requires floor space of 71"W x 82-3/4"D. Ships unassembled. Shipping weight 167 lbs. PRICE INCLUDES SHIPPING! (Truck shipment - see Terms & Conditions). IN STOCK! Reversible for right or left hand use. Main desk measures 66"W x 30"D x 29-1/4"H. Return desk measures 47-1/4"W x 23-1/2"D x 29-1/4"H. Requires floor space of 66"W x 77-1/4"D. Ships unassembled. Shipping weight 148 lbs. PRICE INCLUDES SHIPPING! (Truck shipment - see Terms & Conditions). IN STOCK! Includes main Executive Desk with Steel Modesty Panel (71"W x 35-1/2"D x 29-1/4"H), Credenza (71"W x 23-3/4"D x 29-1/4"H), Bridge (47-1/4"W x 23-1/2"D), Box/Lateral Storage Unit (35-1/2"W x 22"D x 21-1/4"H) and Glass Door Hutch with Legs (71"W x 14-3/4"D x 43"H with 27-1/2" clearance under storage compartment). Measures 71"W x 106-1/2"D x 72-1/4"H overall. Reversible for right or left hand use. File unit ships assembled, workstation and hutch ship unassembled. Shipping weight 501 lbs. PRICE INCLUDES SHIPPING! (Truck shipment � see Terms & Conditions). IN STOCK! 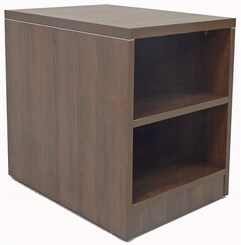 Provides ample filing storage while making the perfect visual accent behind any desk. 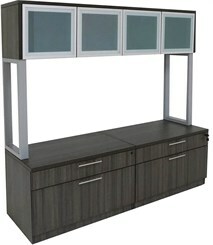 Includes two Y11131 36"W Box/Lateral File Storage Units plus Y11134 Glass Door Hutch w/Legs. Measures 71"W x 22"D x 64-1/4"H overall. Files ship assembled, hutch is unassembled. Shipping weight 357 lbs. PRICE INCLUDES SHIPPING! (Truck shipment - see Terms & Conditions). IN STOCK! 1 - 2 $1,349.00 ea. 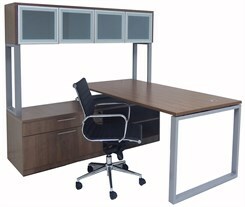 Just like the desk sold above but with the added convenience of overhead storage. Package includes one Executive Desk, 36"W Open Storage Unit, a 36"W Box/Lateral File Storage Unit and a 71�W Frosted Glass Door Hutch with Legs. Main desk measures 71"W x 35-1/2"D x 29-1/4"H. Measures 64-1/4�H from floor top of hutch. Requires 71" x 71" of floor space. Reversible for right or left hand use. 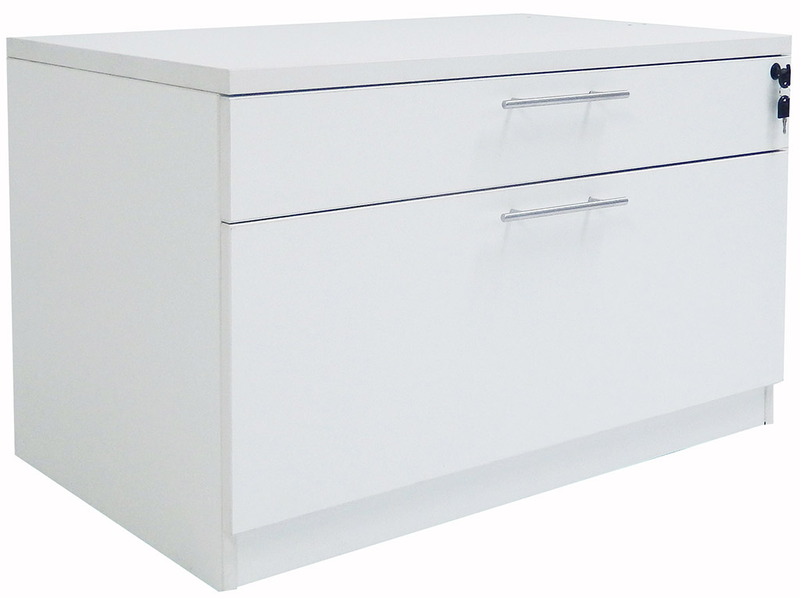 File unit ships assembled, desk, hutch and open storage unit ship unassembled. Shipping weight 431 lbs. PRICE INCLUDES SHIPPING! (Truck shipment - see Terms & Conditions). IN STOCK! 1 - 2 $79.00 ea. Attractive privacy screen can be used on any desk or table with open visitor side. 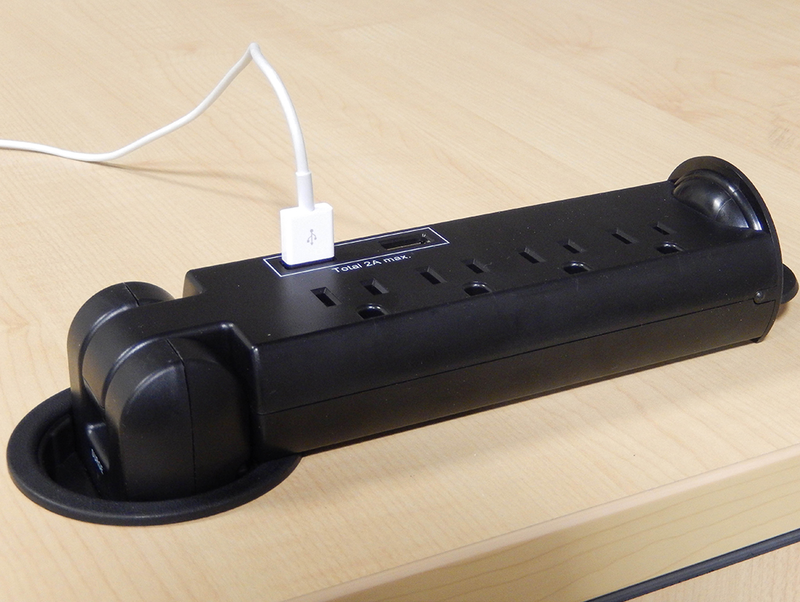 Measures 59" wide and extends down 18-1/4" from underside of desk. Silver paint finish only. Includes wood screws and brackets for easy mounting. Shipping weight 16 lbs. PRICE INCLUDES SHIPPING! IN STOCK! 1 - 2 $129.00 ea. Stackable on Open or Box/Lateral File Storage Units or can be used as a spacer between desks. Includes one adjustable shelf. 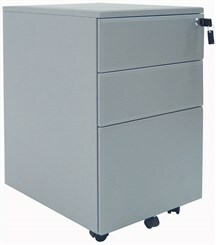 Measures 15-3/4"W x 22"D x 20-3/4"H overall. Ships unassembled. Shipping weight 42 lbs. PRICE INCLUDES SHIPPING! IN STOCK! 1 - 2 $449.00 ea. 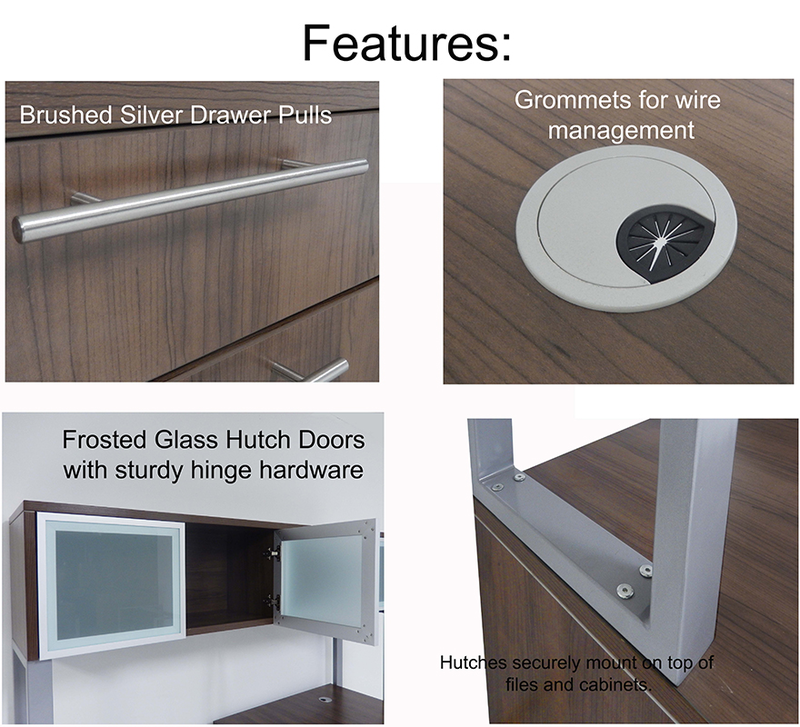 Convenient overhead storage features tempered glass doors and silver metal door frames. Measures 71"W x 14-3/4"D x 15-3/4"H overall. Interior measures 13-1/2"H. Ships unassembled. Includes wall mount bracket. Wall mounting screws not included. Shipping weight 119 lbs. PRICE INCLUDES SHIPPING! (Truck shipment - see Terms & Conditions). IN STOCK! 1 - 2 $549.00 ea. 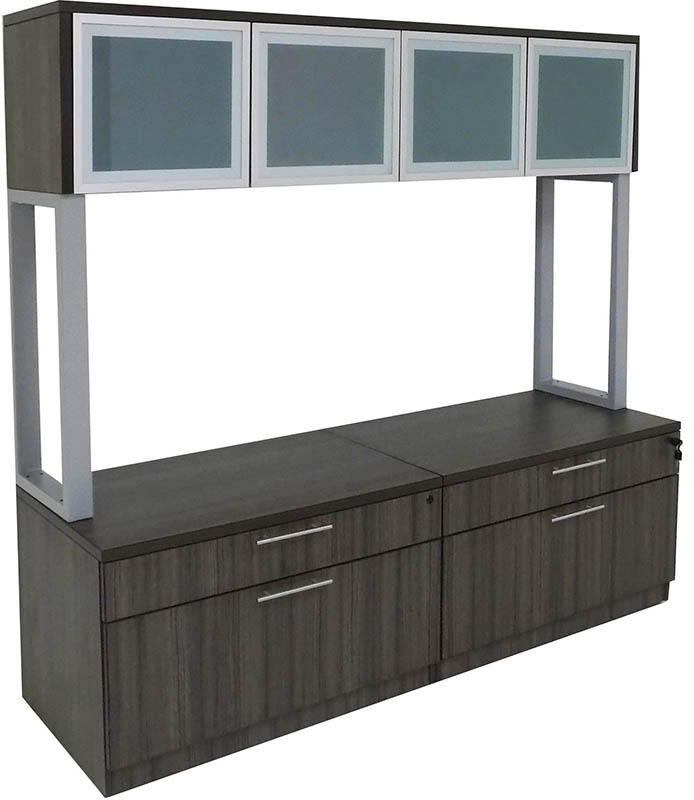 Convenient overhead storage features tempered glass doors and silver metal door frames. 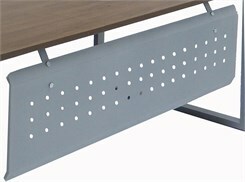 Holes in leg bases and bolts provided for mounting into preinstalled inserts in Open or Box/Lateral File Storage Units. Measures 71"W x 14-3/4"D x 43"H overall. 27-1/2" clearance under storage compartment. Shipping weight 137 lbs. PRICE INCLUDES SHIPPING! (Truck shipment - see Terms & Conditions). IN STOCK! 1 - 2 $169.00 ea. Translucent acrylic panel connects to one desktop with two one-sided chrome finish clamp mount brackets provided. 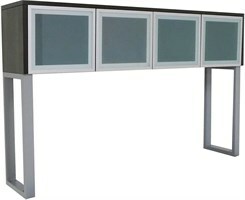 An attractive divider for the open office environment. 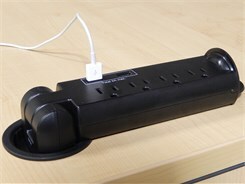 Connects to back edge of main desk. Measures 63"W x 13"H. Shipping weight 12 lbs. PRICE INCLUDES SHIPPING! IN STOCK! 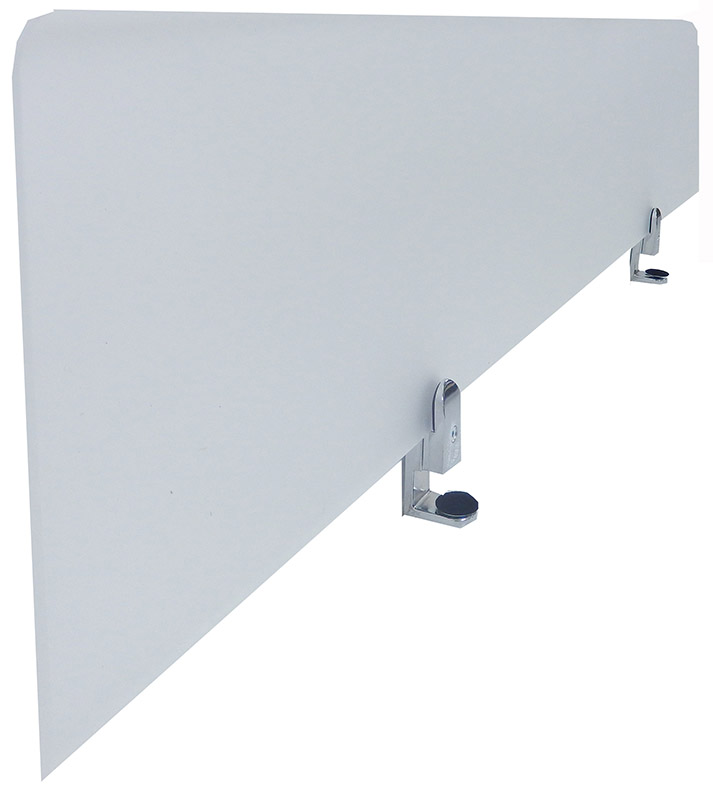 Translucent acrylic panel connects between two desktops with two double-sided chrome finish clamp mount brackets provided. An attractive divider for the open office environment. Connects to back edge of main desk. Measures 63"W x 13"H. Shipping weight 12 lbs. PRICE INCLUDES SHIPPING! IN STOCK! Translucent acrylic panel connects to one desktop with two one-sided chrome finish clamp mount brackets provided. 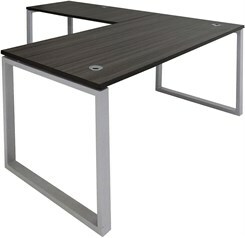 An attractive divider for the open office environment. Connects to back edge of main desk. Measures 71"W x 13"H. Shipping weight 12 lbs. PRICE INCLUDES SHIPPING! IN STOCK! Translucent acrylic panel connects between two desktops with two double-sided chrome finish clamp mount brackets provided. An attractive divider for the open office environment. Connects to back edge of main desk. Measures 71"W x 13"H. Shipping weight 12 lbs. PRICE INCLUDES SHIPPING! IN STOCK!